The 4-AT-A carried eight passengers and had a crew of two in an open cockpit and was powered by three 200 hp Wright J-4 Whirlwind engines. In 1927, this was followed with an improved 4-AT-B with a larger wingspan, seating for twelve passengers and was powered by three 220 hp J-5 Whirlwinds. The last version of this series was the 4-AT-F powered by three 300 hp J-6 Whirlwinds. Total 4-AT production was 78. The next series was the 5-AT-A with a larger wingspan and seating for thirteen passengers. This was followed by the 5-AT-B with fifteen seats and then the 5-AT-C and D with seventeen seats. The crew consisted of three, two pilots and one flight attendant. All models were powered by 420 hp Pratt & Whitney Wasp radials. Total 5-AT production was 117. Additional aircraft production included three 6-AT-As powered by 300 hp Wright J-6 engines and one 8-AT freighter making the total production as 199 Trimotors. The 9-AT, 11-AT and 13-AT were conversions of either the 4-AT or 5-AT. The 10-AT and 12-A were unbuilt projects and the 40-seat 14-A was never flown. When the Trimotor was first built, the service life of the plane was only expected to be 2,500 hours.4 However, Trimotors remained in service long after they were expected to be retired, creating a testament as to the quality of and workmanship of the airplane. This set a new standard for the expected service life of future aircraft. The Ford Trimotor was of all-metal construction of three-layered "Alclad" aluminum sheeting. The sheeting core metal was duralumin which had coatings of pure aluminum on either side, making it highly resistant to corrosion, even at the edges and where it was riveted.5 This process created a material that was very durable and long lasting. 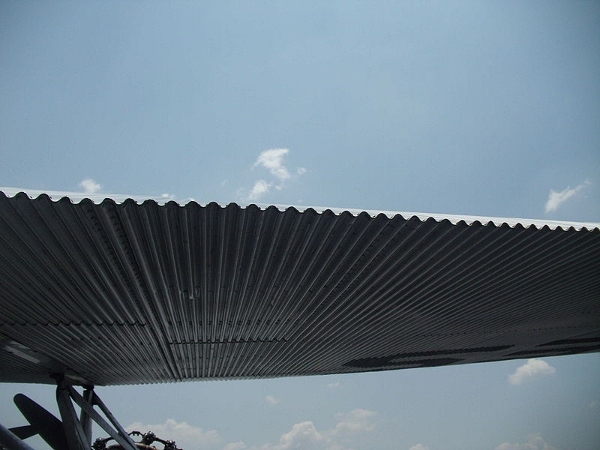 The metal sheeting was also corrugated which provided additional strength, but also increased drag thus decreasing overall performance. Unlike most aircraft at the time, the flight controls were also all-metal rather than fabric covered. Flight controls were normally fabric covered to reduce weight and were easier to balance. The Ford Trimotor's corrugated skin gave additional strength, but also increased drag. The airplane used simple systems that were easier to maintain and gave it a reputation for ruggedness. The flight control cables were routed outside of the fuselage as was common at the time and engine gauges were mounted outside on the engine cowling to be viewed by the pilot from the cockpit. There were several notable flights for the Ford Trimotor. A Ford 4-AT Trimotor, named Floyd Bennett, flew on an expedition over the South Pole, led by Richard E. Byrd who was accompanied by three other men. The round trip flight took approximately 19 hours. Another Ford 4-AT Trimotor, serial number 10 built in 1927, made many notable flights by Charles Lindbergh and Amelia Earhart. 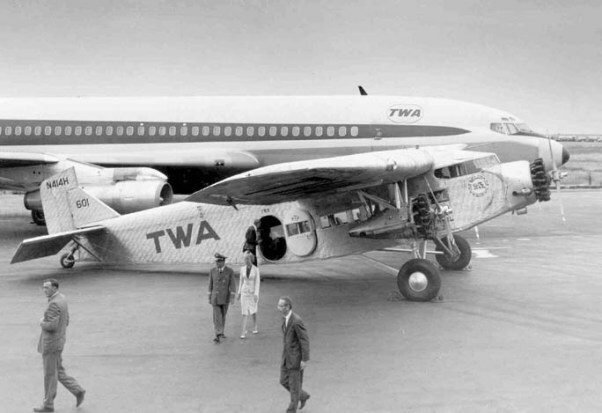 A Ford Trimotor placed next to a TWA Boeing 707 during a promotional tour (circa 1966). Three 420 hp (313 kW) Pratt & Whitney Wasp, 9 cylinder engines. 1. William T. Larkins. Aircraft in Profile, Volume 7. Garden City, New York: Doubleday & Company, Inc. 1970. 124. 2. C. V. Glines. 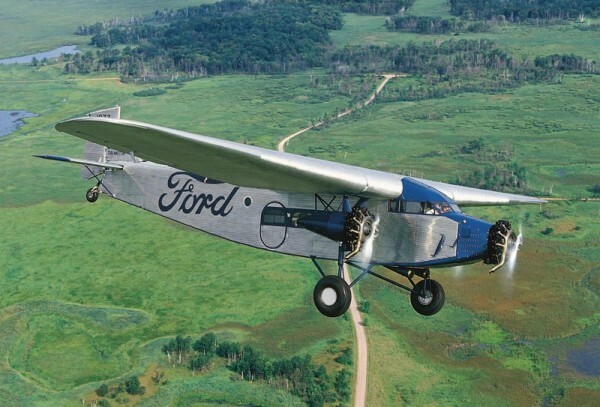 Ford's Forgotten Aviation Legacy Aviation History. May 2008. 30. 3. Kenneth Munson. Airliners between the Wars 1919-39. New York: The Macmillan Company, 1972. 139. 4. Heiner Emde & Carlo Demand. Conquest of the Air. New York: Viking Press, 1968. 98. 5. William T. Larkins. 126. 6. Enzo Angelucci and Paolo Matricardi. World Aircraft 1918-1935. New York: Rand McNally & Company, 1976. 223. Created October 9, 2013. Updated January 19, 2014.